Born in Japan, Arisa studied at the Guildhall School of Music and Drama (where she now teaches) with David Takeno. 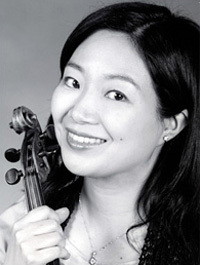 She has performed extensively worldwide both as a soloist and as the Fujita Piano Trio formed with her two sisters. The Trio have performed at major London venues since their Wigmore Hall debut in 1999 and continue to give concerts throughout the UK, in more than 100 venues. Arisa has being attending the Open Chamber Music Seminar of the IMS Prussia Cove for many years and has also taken part in their national tour. Following a release of critically acclaimed CD of chamber works by Toru Takemitsu on ASV Label, Arisa has recorded Ysaÿe 6 Solo Sonatas, Tchaikovsky Trio, Shostakovich/Ravel Trios, Schubert Trios and Dvorak“Dumky”/Smetana Piano Trios all with Intim Musik Label. Recently, she has performed with Steven Isserlis at the Wigmore Hall and in Japan, toured Sweden with Belgrade Philharmonic Orchestra and performed Beethoven Triple Concerto with Kyoto Philharmonic Orchestra in Japan. Future engagements include concerts in Sweden and throughout the UK including a recital tour in Scotland in the autumn with the pianist Sam Haywood.